For the insert that hold the markers in place, it is really very easy. Here is what you need . This is the grid that hold the markers in place. It is only florescent light covers from Plaskolite I bought mine at Lowes. You can cut the grid with wire nippers. The size is 19 holes x 19 holes. (that means you have that dimensions after cut. ) You need two of them. On the bottom layer you will need to make a notch on the back side. I hope you can tell with this picture. 8 - 1/4 inside diameter one inch long nylon couplers. (I had to use 2 for each corner.) or 4 if you can get 2 in. long couplers. Top view with the lid shut. Side view sitting on end. Well let me know what you think. Any questions I will try to answer. This is my project for this month. `And ever since that,' the Hatter went on in a mournful tone, `he won't do a thing I ask! It's always six o'clock now.' A bright idea came into Alice's head. `Is that the reason so many tea-things are put out here?' she asked. 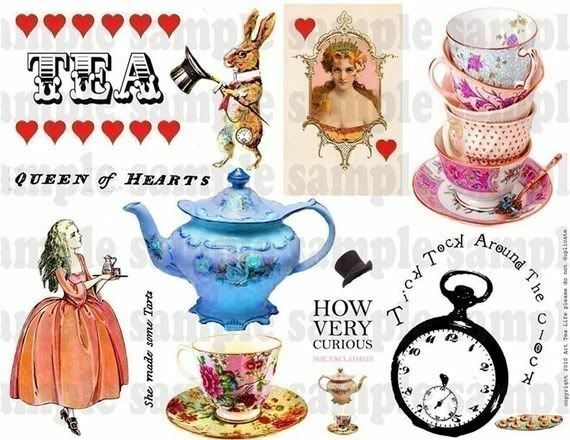 `Yes, that's it,' said the Hatter with a sigh: `it's always tea-time, and we've no time to wash the things between whiles.' `Then you keep moving round, I suppose?' said Alice. `Exactly so,' said the Hatter: `as the things get used up.' `But what happens when you come to the beginning again?' Alice ventured to ask. The Mad Hatter's tea table was full of tea-things, with place settings all the way around and many teapots and teacups. 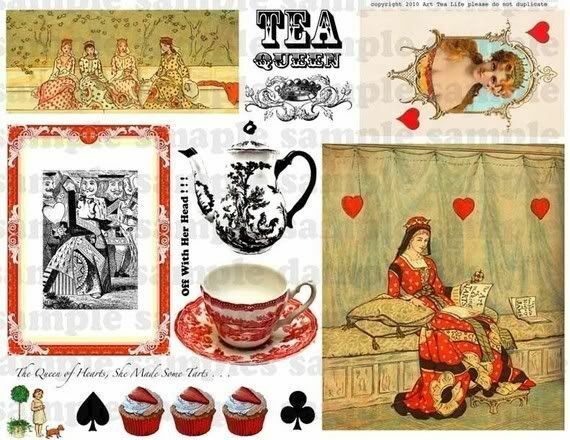 Your challenge this month is to have a teapot or teacup on your project, and, as an option, to use something OTHER than a stamped image as your focal point! 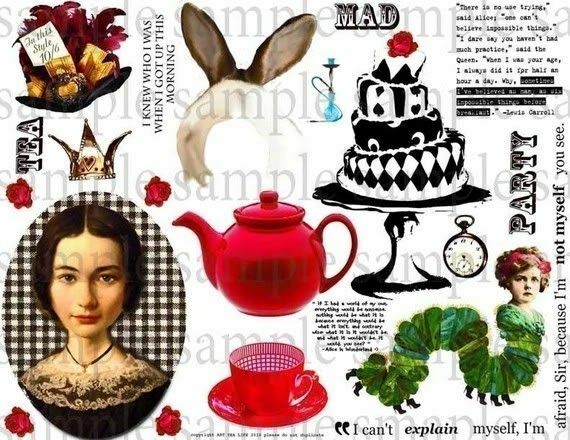 That's because The Altered Alice design team will be showing off with digital collage sheets from One Crabapple [Etsy Store | Blog], which has of the most interesting and different Alice in Wonderland categories I've seen! The winner will have their choice of five collage sheets from One Crabapple! July is a long month, so you have almost four weeks to enter your project! Plenty of time for even our stragglers to play along, just be sure to enter by 11:59 p.m. EDT (Eastern Daylight Time, UTC -4:00) on Friday, July 29. The winner and honorable mentions will be announced the last Sunday of the month on July 31. This is my project for this month. I used my black and white printer for this. I colored it in with prisma pencils and gamisole. I wanted Alice to have a blue dress. I also wanted the tea pot to have a antique tea pot look. Then I loved the way the tea cups looked, great just in the black and white form. I sprayed the cups with the perfect pearls mist. and the tag was embossed with the clock works folder. Then sponged with faded jeans Distress Ink. Then sprayed with blue smoke perfect pearls mist.. The ribbon tied on the top is seam binding. I pounced the faded jeans on the ribbon the sprayed it a couple of times with perfect pearls to spread the ink. I really like the way it turned out. background paper of my card it has the tarts. What are you going to bring. Join Us for a MAD TEA PARTY! 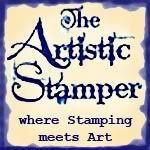 Our generous sponsor this month is The Artistic Stamper, and they are offering a£15 pound voucher for The Artistic Stamper stamps! They have a WONDERFUL online store that offers free worldwide shipping on orders over £35 and they carry loads of my favorite brands. The Artistic Stamper Creative Team Blogoffers amazing inspiration and interesting challenges, so be sure to visit! 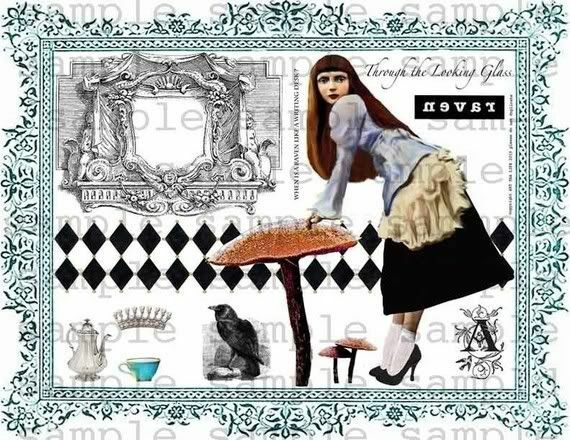 Jennie has kindly provided our design team with the Mabel Lucie Attwell Mad Hatter Stamp for our projects this month. It will be interesting to see how everyone applies their own style and vision to the same image! 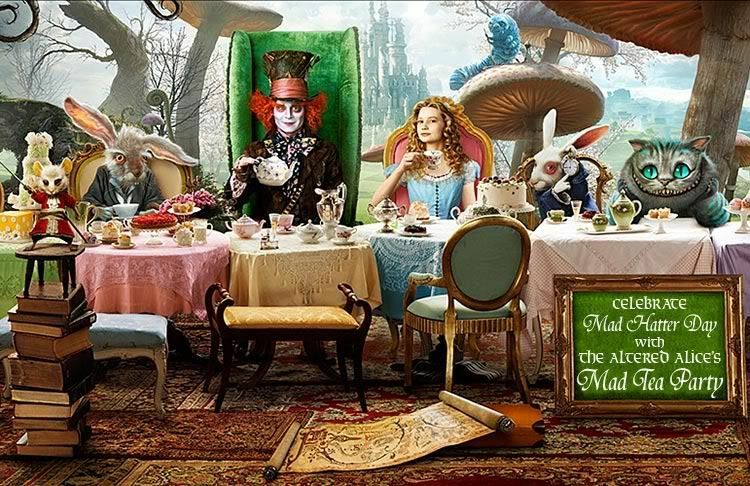 The challenge this month is to create a project to celebrate the Mad Hatter, AND to bring something to our Mad Tea Party! 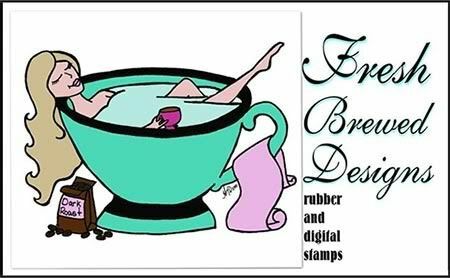 You have until Friday, June 24 at 9:00 p.m. Eastern Daylight Time (GMT -4:00) and we'll announce the winner of the £15 voucher for The Artistic Stamper stamps on Sunday, June 26! Time marches on so it's time for a new challege, and the challenge is to make something that represents TIME! Take your time, you have until May 27 at 8 p.m. Eastern Daylight Time (GMT -4:00) to show us YOUR timely creation! There are so many ways to represent time - you could use a clock or a watch, hourglass, calendar. . . take some TIME to think about it and then be sure you submit on TIME because TIME flies! Ok, I think I have it out of my system. . . or is that my clockworks? 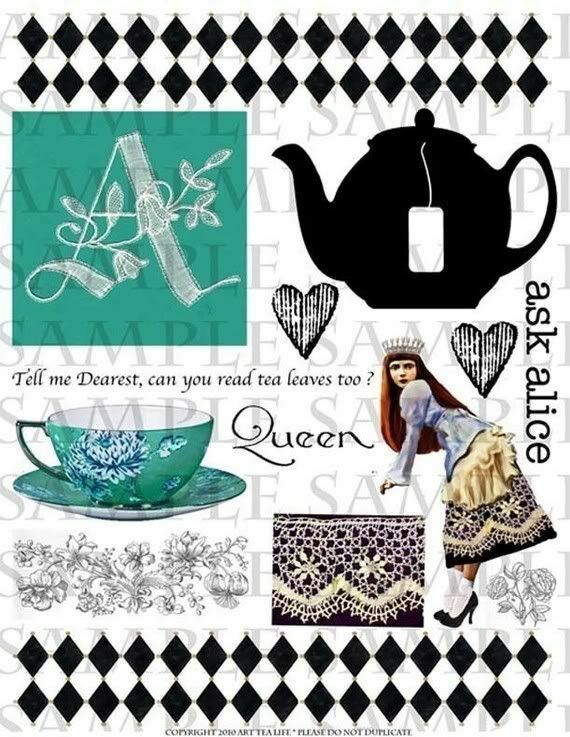 Our sponsor this month is Fresh Brewed Designs, and they have some fabulous Alice in Wonderland digi images that some of the design team will be using. 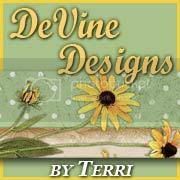 The randomly chosen winner of this month's challenge will receive five digi stamps of their choice from the Fresh Brewed Designs store! 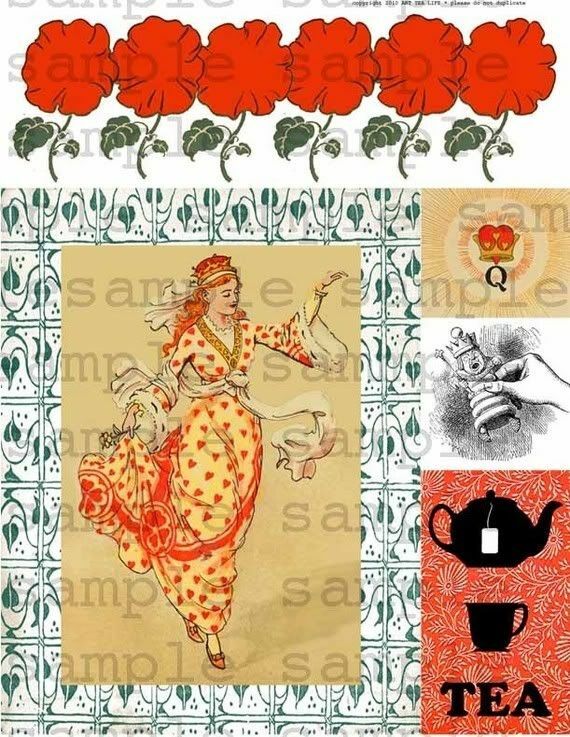 While it is not required that you use Alice in Wonderland images, we do encourage it. Entries that feature some aspect of Wonderland will be entered twice for the prize drawing! Three guest designers will be joining us for May: Jess Marin of My Scrap Diary will be sharing her project in our Week 3 post, and Retta Fox of Foxy's Weblog and Tracy (CuddlyBunny) of Not a Moment to Spare will be sharing their creations during our Week 4 inspiration post. I know you will enjoy seeing the work of these talented designers, two of whom are past entrants to our challenges! I just loved the Fresh Brewed Designs they were so much fun to color. us with this months designs. This was a freebie from Just Inklined. which I embossed with the new SU framed tulips folder. This is the colors I used. This is my daughter and son-in-laws Easter card for this year. 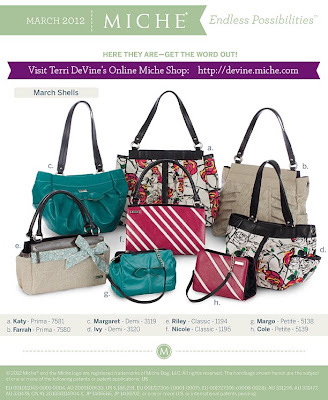 Order online or email me about discounts! I am a single happy person. I also have a daughter who is 22 and is the light of my life. I am very happy with where I am at this point in my life. I'm a Twilight Addict, Are You? Right-mouse to save image. You can use this badge to link to my blog! Custom elements by Lynne Phelps. Ethereal theme. Powered by Blogger.